I saw the folded piece of paper at my feet when I went to put my groceries in the back of my van. It was folded neatly in half and half again. I found it at 4:32 PM on a fall day in Pennsylvania. I was with my youngest daughter. I don’t know if I would have picked the paper up if she hadn’t been with me. We were pretending to be detectives, and the piece of paper at our feet was a clue to a mystery. We unfolded the wrinkled paper in the car and read the note. Was the paper a secret message? What could we tell about the person from the writing on the paper. 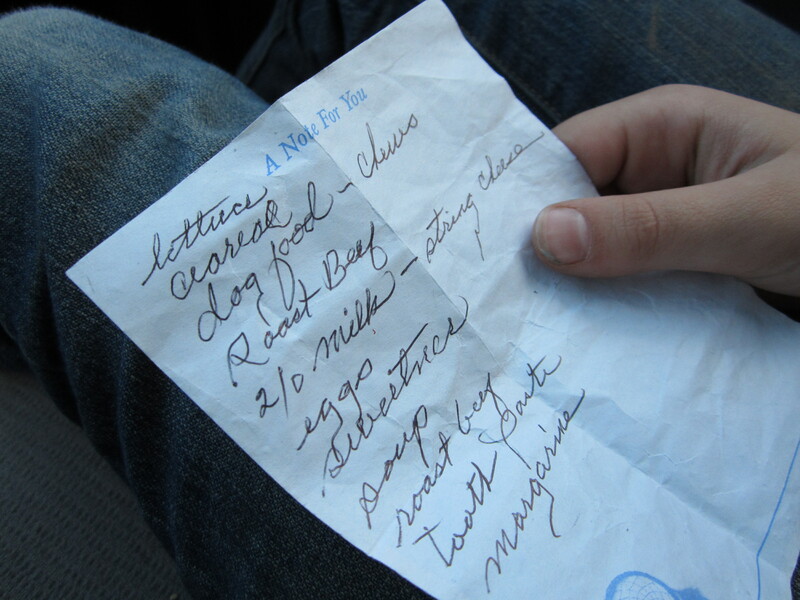 The note was a grocery list, written in cursive. The handwriting was similar to how my Grandmother wrote. Was the person old? They wrote roast beef on the list twice. Were they forgetful? Why was the paper so wrinkled? The paper looked like it had been crumbled, then smoothed out and refolded. She wrote ceareal [sic] on the list, but she did not list what kind of cereal. The person who had the grocery list either knew her well enough to know what kind of cereal she liked, or she wrote the list for herself. From the list, I know she has a dog, and used margarine instead of butter. Does she have a heart condition, or does she have limited funds. Butter is more expensive. Was the food on the list all she could afford for that week? I have had the piece of paper on my desk for several days. I don’t want to throw it away. This morning when I woke up I prayed for the woman who wrote the note. I wonder if her dog is all right. When I shop in the grocery store next to the parking lot where I found the note, I look at the grocery lists people are carrying. I look for the same kind of paper she had written her list on. Perhaps I have walked past the person who wrote the list and didn’t realize it. Today when I went to buy groceries an elderly woman parked in the handicapped spot and walked into the grocery store carrying her list. I didn’t stop the woman and interrogate her. I prayed for her, and I prayed for the woman who lost her grocery list. I prayed for her health and her memory. I prayed she would have enough money to buy roast beef and dog food and cereal this year for Christmas. I prayed she would have someone to sit with on Christmas Day.